As I tell people about my book all over the country, I get a lot of great feedback on places to go. This was no different when John and I were down in Florida near New Port Richey celebrating his mom’s 90th birthday with his family. 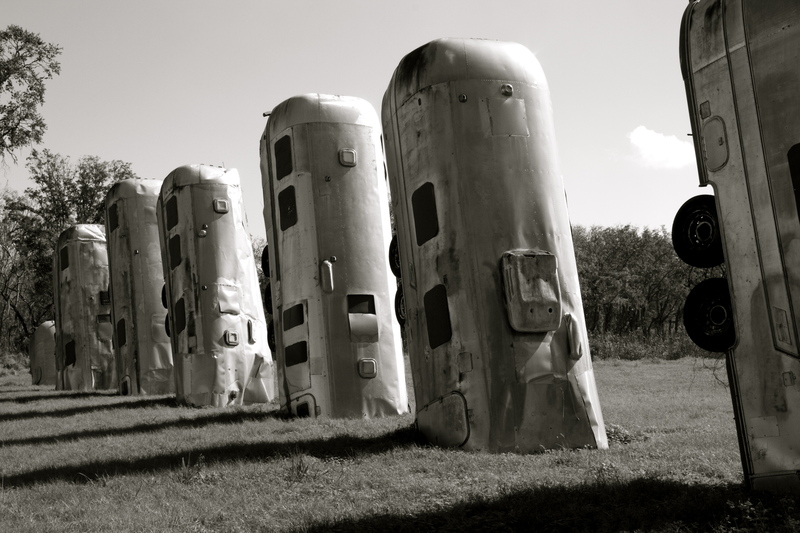 One of his friends mentioned Airstream Ranch, which is modeled off of Cadillac Ranch, but using slightly bigger art. Of course, I had to go. So we set off on our way back to Orlando to fly home to see the Ranch and take pictures. A sort of pilgrimage for me. I’ve been researching and looking towards buying an Airstream for nearly a year now and am about to pull the trigger. Airstream Ranch was built by the good folks at Bates RV just off I-4 between Tampa and Orlando. (Manchester exit). Apparently, there was much discussion (pro and con) about its installation among the neighbors. Quite honestly, since most of the neighbors all live in trailers, it was hard to see what all the fuss was about. Even now, the woman who owns the property adjacent will not allow trespassers. To get a good photograph, one must trespass. Up close, it’s pretty amazing! About 9 or 10 various models of Airstreams sticking at an angle out of the ground. They’ve been beat up a bit, which adds to the sculpture like quality of the hulls, but they are all still standing. It’s quintessentially American: to do these odd things because you can, because it advertises the work you do, and, really, because it’s kinda cool! It was great to see. I’d go back next time we’re near there to see it again. Bates RV was a great place, too. Lots and lots of Airstreams. We looked at a Flying Cloud 20 ft Mocha Blue and the 22ft Sport Model. Unfortunately, we want a larger bed. I’m told by friends, however, that Bates RV is a terrific place and has good people to work with. We met a nice guy named Seann. Are you considering a newer model, or trying to refurbish an older one?